I came across this interesting article written by Kathy Van Mullekom for The Daily Press. It answers many questions we have about annuals while providing a good overview of what are types available. I thought I would share it with you. When spring trees and shrubs finish flowering and perennials are past their peak performance, flowering annuals give your yard a new sense of purpose and color. 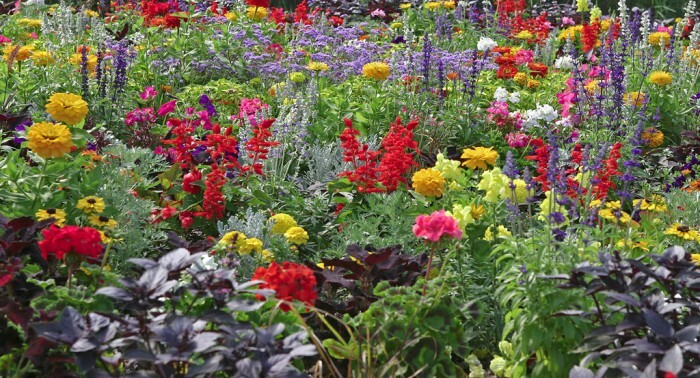 Annuals, which die when fall’s killing frosts hit them, are ideal for many reasons. Beginning gardeners will like how easy they are, especially petunias, zinnias, impatiens, pentas and begonias. Container gardeners will like how versatile they are in pots, especially coleus, caladium, bacopa, sweet potato vine and Persian shield. Butterfly gardeners will like how they provide nectar, especially salvia, French marigold, cosmos, ageratum and primrose. Shade gardeners will like the fact there are annuals that bloom without sun, especially impatiens, spider flower, Canterbury bells, dusty miller and flowering tobacco. * SuperVinca. Full sun for this plant produces pink flowers that cover its thick glossy foliage. The plant, which does nicely in the ground or in pots, grows 16 inches tall and 25 inches wide. Vincas often reseed to produce new plants the next growing season; to encourage reseeding, avoid disturbing the soil too much, especially when you apply new mulch. * Big Begonias. These durable plants get bigger and better, yielding 2- to 3-inch flowers and an upright, arching growth habit. Bronze foliage adds vibrancy to rose-colored flowers in full sun to shade. They thrive when planted near concrete patios and pool decks that heat up in summer’s sun, a condition that stresses some annuals – but not begonias. * Discovery Marigold. This dwarf African version features 3-inch yellow flowers that are showy and long lasting in a flower border or pots on the porch. The compact plant reaches 6-8 inches tall. Marigolds are known to deter bad bugs and bring good bugs. * Garden Statement Sunflower. The first lemon yellow sunflower with super duplex flowers has three layers of petals. Branched stems on the upper third of the 3-foot plant prolong flowering and performance. Songbirds love the seeds left behind. * Distance Cherry Zinnia. You can always count on zinnias to bring butterflies to the summer garden and this one is no exception, especially when the weather is hot and unrelenting. Eye-catching 2- to 3-inch hot pink flowers appear all summer. Put them in sunny beds, border or patio pots. * Catalina Gilded Grape Torenia. This prolific annual starts blooming early and stays on track until late fall. Use it in hanging baskets or as a ground cover in a shady spot. Yellow blooms with a gilded grape throat resemble snapdragons. The plants grow eight to 16 inches and the flowers need no deadheading, so you just sit back and enjoy them. The blossoms attract hummingbirds but not deer; they are also pet friendly. * Tukana Scarlet Star Verbena. This new introduction makes large scarlet and white flowers throughout the season. Use it in combination with pink petunias for real drama. The plant prefers full sun, reaches 4 to 8 inches tall and looks good in hanging baskets or as a ground cover. * Luscious Citrus Blend Lantana. Brilliant tones of red, orange and yellow produce a vibrant display of color on an annual that smells sweet, adores sun and stays looking good in heat and drought. The blooms bring butterflies and hummingbirds; no deadheading is needed. Warning: Keep it away from pets because the foliage can be toxic. * Citrus Petunia. This vigorous flower comes in a strong yellow color that doesn’t fade in the heat or hot sun. Beneficial for butterflies and hummingbirds, the plant works as a spiller in containers, hanging baskets and window boxes. No deadheading needed. * Allure Geranium. Forget the traditional red geraniums that grandma grew. Allure geraniums come in 12 colors and flower patterns for head-turning results. But, as always, give the plants full sun and moderate moisture. * Ornamental peppers. Calico shows off variegated foliage in a color pattern of purple, cream and green and is highlighted by glossy fruit that starts red and matures to black. Purple Flash grows with leaves that are almost black with “flashes” of bright purple, and topped with small, round, glossy black fruit. Sangria products purple and red peppers. All are child-safe varieties good for indoor and outdoor use. Learn more about new varieties in flowers and vegetables through the National Garden Bureau at www.ngb.org, Ball Horticulture at www.ballhort.com, Proven Winners at www.provenwinners.com and Simply Beautiful at www.Simply BeautifulGardens.com.